I've had a couple of conversations over the last week or so on the subject of building scripts to be as robust as possible. It's a pretty large subject though and would be a huge post, so instead I've decided to pick out one topic in particular that came up and leave the rest for another day. You'll have guessed from the title of this post that the topic I've chosen is around how to create an empty table in QlikView, and more importantly, why the hell would I want to anyway. Let's consider a scenario, I have a number of spreadsheets containing budget data, they all have a similar structure and each spreadsheet contains a single month's budget. The file names all use the same naming convention starting "Budget" followed by the year and month for which they hold data (eg. "Budget 2012 Jan.xls"). There us one problem with this though, the keen eyed will notice I said that the files have a similar structure which would suggest they aren't all exactly the same. Because of this a wildcard load would fail. Even if it did work, without the same structure the files wouldn't be concatenated into the same table anyway. Alternatively I could choose load the files in one-by-one as I know their file names, concatenating them into the same table to use in my app. But this would mean that if I add more budget files in the future, I have to modify the script to add the new tables and this would create a high maintenance app. There is a problem with this code though, the table MyBudgets doesn't yet exist and thus, for the first file it tries to load, the CONCATENATION statement will fail. As with everything in QlikView there is more than one solution to this problem. One approach is to check within the loop if the table exists and if not then create the table instead. This is a perfectly valid method but doubles the amount of code I need to write. My preferred is to create an empty table called MyBudgets first so that the loop can simply concatenate all files to it. Problem solved! You can use this trick even if you don't know the name of a field. Simply create the empty table with a dummy field name such as "MyDummyField" and then drop the field after you've concatenated the tables to it. Writing the previous post Removing Leading Zeros reminded me of a lesson I learnt (the hard way) a few years ago about how QlikView perceives data types. 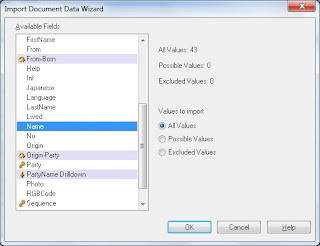 Anyone who has worked with QlikView for more than a few days will have realised that you don't have to explicitly tell it which data type a field contains. Instead, QV decides for itself and it does this at a value level rather than having a single data type for every entry in a field. Normally this makes a developer's life very simple and helps to speed up the process of building data models. I'm sure no one, including myself, would argue it is a bad thing but there is one situation where this can cause you a huge headache. QlikView is possibly a little too clever when it comes to what it considers to be a number, and as well as looking for values which are composed of all digits, it looks for other possible number formats also. For example, QlikView considers that a value of 5E3 means 5 times 10 to the power of 3 which if you perform the math is 5000 in digit form. On the surface this might not seem a problem but a few years ago I came across a customer who was complaining of lost products in their QlikView application and after scratching my head for 2 days trying to find the problem I finally discovered the cause of the issue. The client's product IDs where made up of 6 hexadecimal characters. For those who aren't familiar with hexadecimal, as well as the numbers 0 to 9, hex uses the letters A through F also and this obviously means its perfectly possible to have values such as 0005E3. And as you will have guessed by now, this was considered the same product as 005000. What makes this problem even more difficult to find is that QlikView displays whichever of two values it happens to come across first. So if it finds product 0005E3 first, product 005000 seems to have disappeared and its data is linked to the former. If it comes across product 005000 first, product 0005E3 seems to have disappeared instead. Thankfully fixing the problem is a lot easier than finding it and simply wrapping the field in the text() function forces QlikView to consider them as strings rather than numbers and thus won't consider the values as the same. The chances of you stumbling upon this same issue are pretty slim but if you ever do, knowing this will hopefully save you a lot of time and a very real headache. That aside, hopefully I've made you think a little about how QlikView interprets the data you give it. This code first uses the replace() function to replace all zeros in the field with a space and then uses the ltrim() function which removes spacing from the begining of a string only. We then use replace() again to convert any remaining spaces back to zeros. Even the newest of QV developers have likely used an inline load and be familiar with the below screen. For those that might not have come across them, inline loads allow you to define a table of data within the QV script. You can use to wizard to create them which is available from the Edit Script dialog by using the menu, Insert -> Load Statement -> Load Inline. This gives you the option of inserting values from existing fields in the data model. Please note, QlikView can't guess what the values will be when the script is next run so will show you the fields and values currently available in the app from the last time the script was run successfully. 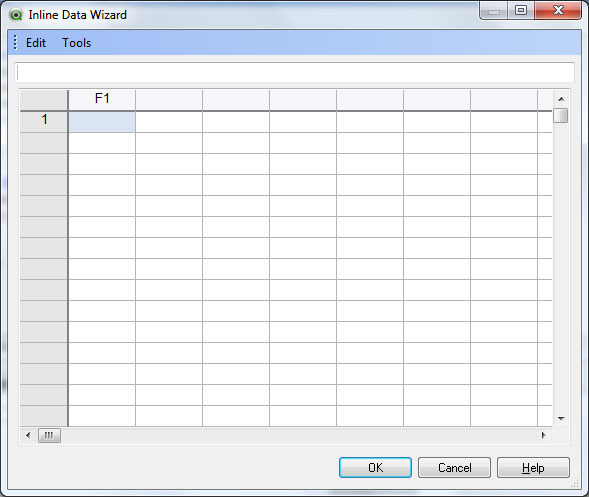 Clicking OK will paste the values into the Inline Data Wizard window. And it's as simple as that. I most commonly use inline loads to create small, static mapping tables and this obviously means taking data from the existing data model and mapping them to groups or new values. This little trick is perfect for this and can save you having to create a temporary list box in the front end t copy the values from. I answered a question on the QlikCommunity the other day and it reminded me of something I've not done for a little while, looping through sheets in an Excel file within a QV script. What if I want to load from an .xls file instead of a .xlsx file? Not a problem, simply change the Connect and Load statements accordingly. What if I want all the sheets loaded into a single table? You can create a blank table first, then use the above to concatenate the sheets into it rather than into their own named tables. What if the Excel file always has one sheet but it is named differently each time? Tweak the above to load the sheet into a known table in QV. What if, rather than loading all sheets from the file, I want to load only those which start with a known string (eg. "My Data Tab 01/01/2012", "My Data Tab 01/02/2012", etc). Simply wrap an IF statement around the LOAD to check if the table name starts with the required string. I've probably only ever used this trick a handful of times, but its a very useful tool to have in your pocket should you need it. Those familier with manipulating data in SQL or other BI technologies should have no problem understanding the different types of joins available in QlikView. But those who aren't sometimes need a little explanation and it's a topic that I've fond myself explaining often when training people. It is important to note that QlikView links records based on matching field names in the two tables being joined. 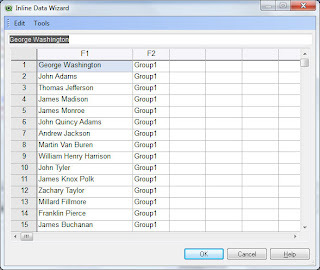 In the example above, both tables contain a field called Field2 and thus QlikView will look for matches across these fields. Also worth noting is the the table name defined in curved brackets. 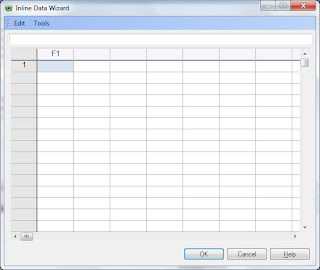 This defines the previously loaded table which the following table should be joined to. It is not mandetory but it is considered best practice to always specify a table to join to inorder to avoid confusion or mistakes. 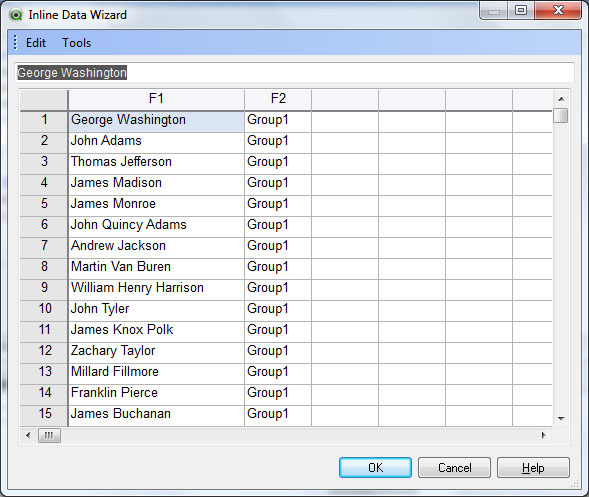 Without it, QlikView joins the table of data to the previously loaded table. You will notice that there is a blank entry in Field3. This is because no matching record exists in the second table. You will also notice that the record in the second table for which there is no match in the first table has not been included. You will notice that there is a blank entry in Field1. This is because no matching record exists in the first table. You will also notice that the record in the first table for which there is no match in the second table has not been included. You will notice that there are no blank entries. Records from either table for which a match was not found have not been included. You will notice that there are blank entries in both Field1 and Field3. This is because a matching record was not found in the other table. The produced table contains all possible combinations and therefor the number of rows it contains will be the number of records in the two tables multiplied together. In this example 3 x 3 = 9 records. This isn't the end of the world when data sizes are relatively small, but when mistakes are made joining tables containing millions of records, the resulting table can take a very long time to calculate and be so large that it uses up all the physical RAM and result in the machine becoming unresponsive. Anyone working with QlikView on large datasets for very long will have learnt this lesson the hard way. I remember making a mistake whilst joinging a billion record table to itself and had to explain red faced to the customer's IT department why I needed them to restart the non-responsive server as it tried to calculate the result. A cartesian product isn't always the result of a mistake though and can also be performed on purpose in advanced data transformations. For example, if I have a calendar table with a record for each day but what I really need is to expand it to have a record for each 8 hour shift in each day, there is more than one way to approach the problem. I could load the calendar into a temp table and then concatenate it 3 times into a resulting table denoting the shift each time, or I could create a Shifts table containing a record for each shift and join it to the calendar table providing no matching field and thus purposfully causing a cartesian product.